The premise for developing fiber optic technology was the theory that light traveling over a glass medium could carry more information over longer distances than conventional electrical or radio frequency (RF) signals over a copper, coaxial, or wireless medium. Scientists knew that they would need a glass so pure that 1% of light would have to be retained over 1 kilometer. For attenuation purposes in light retention, this would translate to 20 decibels over 1 kilometer (20dB/km) of glass material. 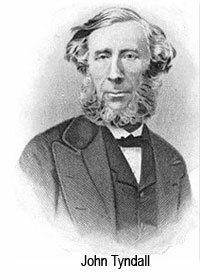 In 1870, a natural philosopher named John Tyndall gave a demonstration about the internal reflection of light within a jet of water. Using water flowing from one container to another and sunlight, he showed the audience how light followed a zigzag path inside the curved path of water. This marked the first research into the guided transmission of light. In 1880, Alexander Graham Bell developed an optical voice transmission device called the photophone. The photophone was able to use free-space light to carry voice over 200 meters. It used specially placed mirrors to reflect sunlight onto a diaphragm attached within the mouthpiece of the photophone. On the other end, mounted within a parabolic reflector, was a light-sensitive selenium resistor. When one spoke into the photophone, the illuminated diaphragm vibrated, casting various intensities of light onto the selenium resistor. This change in light intensity altered the current that passed through the telephone receiver, in turn converting it into speech. • Unless otherwise stated, all optical cable assemblies use either ceramic ferrules or MT ferrules based on NTT's form factor polished with our proprietary termination process. In the 1960s, glass researchers from all around the world started to take on the challenge. Finally in 1970, Drs. Robert Maurer, Donald Keck, and Peter Schultz of Corning Incorporated developed a fiber that had measured attenuation of less than 20 dB per km. Since then, we have advanced fiber optic technology so far that we can send digitized light signals hundreds of kilometers without any amplication. Today, we're approaching the theoretical limits of the technology with achievable limits of less than 0.35 dB per km over 1310 nanometers (nm) and 0.25 dB per km over 1550 nanometers. Optical jumpers can take many forms. The most common form is a duplex jumper, with one fiber acting as a Tx (transmit leg) and the other fiber acting as the Rx (Receive leg). Optical jumper users must understand the relationship between the connectors, cable style and glass fiber. The term "Simplex" indicates that a single optical fiber is being used in the assembly but does not mention what type of glass is to be used (e.g. singlemode, multimode, etc...). The term "Duplex" indicates that the assembly contains two optical fibers. "Duplex" connectors allow two fibers to be terminated while "Simplex" connectors allow just one. Some simplex connectors can be joined together to form a quasi-duplex connector. The U.S. Military was the first to really exploit the new technology in the 1970s. They quickly recognized fiber optic technology's potential for improving communication and tactical tactical systems. Aboard the U.S.S. Little Rock, the U.S. Navy installed a fiber optic telephone link. The Air Force followed suit and developed its Airborne Light Optical Fiber Technology (ALOFT) program in 1976. These applications were so successful that money started pouring into military Research & Development teams to develop stronger fibers, tactical cables, high-performance components, and so on. The next year in 1977, commercial applications started to take place. AT&T and GTE installed a fiber optic telephone system that met demands for a more reliable and higher performance network. In 1990, Bell Labs was able to transmit a signal at 2.5GB/s over 7500 km without having the regenerate. In 1998, they were able to send signals out at 10GB/s for over 250 miles, which is close to the theoretical limit. Distance and capabilities will increase even more once the glass becomes more pure.